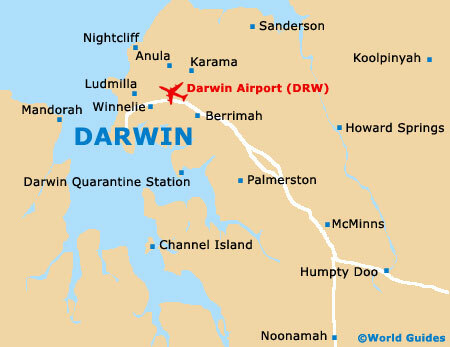 Darwin, in the Northern Territory (NT) of Australia, is the only main city in the 'Top End' of Australia. 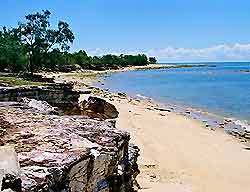 Surrounded by scenic areas of outback Australia, Darwin was established in 1869. A devastating cyclone in 1974 caused tremendous damage to the city, although several of the historic 19th-century buildings managed to survive this natural disaster. Darwin was quickly rebuilt and is now an extremely modern city, with large shopping centres and superb restaurants. Featuring a wealth of Aboriginal heritage, Darwin is by far the most important city in the Northern Territory, being just under 1,500 km / 930 miles to the north of Alice Springs, and provides a good base for travellers heading to the south-easterly Kakadu National Park. The city centre enjoys a peninsula setting and is best reached by taking the Stuart Highway, which leads onto Daly Street. Mitchell Street lies on the south-easterly side of the city centre, across from the Bicentennial Park. This is where you will find the Darwin Tourist Information Centre, which is operated by Tourism Top End and is the best place to book accommodation and tours, whilst also offering useful fact sheets about surrounding national parks. Accommodation options in Darwin are usually fairly inexpensive and easy to come by. Areas with the largest concentrations of hotels include Buffalo Court, Cavenagh Street, Daly Street, East Point Road, Packard Place and Woods Street. Mitchell Street and the coastal Esplanade, overlooking Darwin Bay, are particularly popular places to stay and boast a number of luxury hotels. Of note, hotel reservations are often required several weeks in advance during the busiest peak tourism seasons. More information about Darwin Hotels and Accommodation. Historic tourist attractions for visitors to Darwin include the Myilly Point Historic Precinct - a unique precinct featuring four 1930s houses; Admiralty House - an unusual style house built on stilts; the WWII Oil Storage Tunnels - oil storage tunnels, built underground after the Japanese destroyed all the oil tanks above ground; and the Australian Aviation Heritage Centre - featuring a spectacular display of aircraft and memorabilia. Other popular attractions for tourists holidaying in Darwin and the Northern Territory of Australia include Crocodylus Park - featuring full-grown crocodiles and a small zoo; the Botanical Gardens - with an abundance of flora and fauna and including spectacular orchids; the Darwin Crocodile Farm - where visitors can see over 8,000 sea and freshwater crocodiles; the Indo-Pacific Marine Exhibition - with displays of marine life including sea horses and living coral; the Australia Pearling Exhibition - featuring a pearl oyster farm; and the National Parks of the Northern Territory - offering a wealth of wildlife and scenic landscapes. There are several impressive golf clubs within easy reach as well. 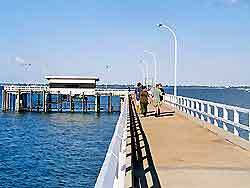 More information about Darwin Attractions and Landmarks and Darwin Golf Courses. Darwin also has some notable local museums, providing detailed Northern Territory heritage information, including both permanent and temporary exhibitions. Some of the very best include the Chinese Museum - with displays of local artefacts and a large Chinese Temple; the Museum and Art Gallery of the Northern Territory - with impressive displays of artwork, including Aboriginal paintings and sculptures; the Military Museum - with displays depicting the city's WWII involvement and experiences; the Fannie Bay Gaol Museum - dating back to 1883, when it was the main jailhouse in Darwin; and the Museum of Arts and Sciences - featuring spectacular displays of Aboriginal art, contemporary paintings and local treasures. More information about Darwin Museums and Art Galleries. 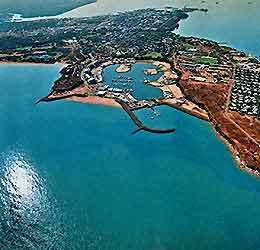 Darwin, the only major city in the Northern Territory of Australia, is situated on the northern coast. With some of the most sunny and dry weather in Australia, throughout the year, the city is a thriving holiday destination, with plenty of things to see and do, including seasonal Aussie carnivals and parades, concerts, local events throughout Darwin, races and busy open-air markets.